Let’s start with a little game. When you hear the term user experience (UX), what is the first thing that comes to mind? Got it? Many of you, but not all, thought of a website or a digital product. This is because most of the focus on UX is around websites. For those of you who thought of something beyond a website, I bet the title gave you a hint. You win for being perceptive. The term user experience was coined by Don Norman based on digital interactions—check out our What is User Experience article if you’re interested in a little more background on the term. However, with growing popularity on the subject, it has grown to include more than just what happens behind a screen. The core of UX is about giving users a good experience with your brand, so that shouldn’t end with their experience on your website. Enter: omni-channel UX, or more accurately, omni-channel CX (Customer Experience). Omni-channel CX is definitely a buzz word right now, and there’s a good reason for it. In this day and age, users often jump from channel to channel to complete a task, but they don’t think of it this way. Users simply think they are interacting with a brand—they don’t think that they are ‘channel surfing.’ Given this mindset, users expect to have a consistent experience with the brand no matter what. If your verbiage changes drastically from channel to channel, users are going to be confused, frustrated, and likely move on to a competitor. No one wants that. Are you giving your users a good omni-channel user experience? 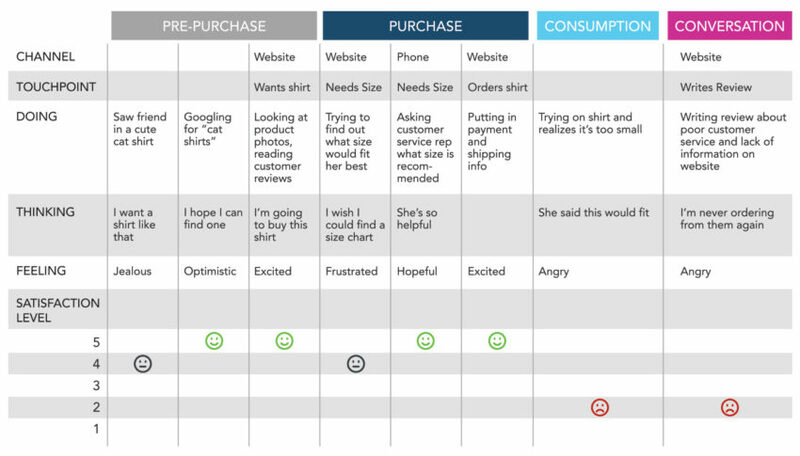 Before we can talk about how to evaluate your omni-channel CX, we need to dive into the specifics. What exactly is omni-channel CX? If you break the term apart, “omni” stems from the Latin word “omnis” which means “all.” So literally translated, omni-channel CX means “all channel user experience.” In a little more detail, it is the experience your user has with your brand across multiple channels and touchpoints to complete a task. Pretty simple, right? Not so fast. To truly grasp what omni-channel CX is, we need to understand the elements of it as well. 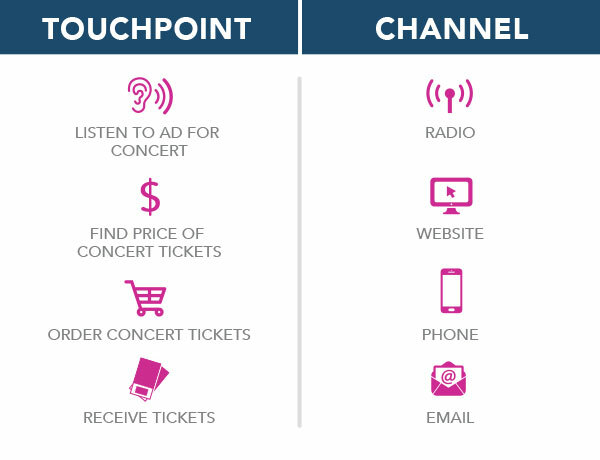 I’ve found that there’s a lot of confusion in the UX world between channels and touchpoints. Let’s define them and look at how they work together. The next piece to understand is a touchpoint. The touchpoint is the actual interaction between you and your user. It can take place on a digital or physical channel, but is the specific interaction you have with your user. Chris Risdon from Adaptive Path described it as “a moment in time,” which I think is a great way to think about it. Now that you understand the difference between the two terms, let’s see how you can use them to your advantage. How do you create a good omni-channel CX? You know what a good omni-channel CX is and you have all these channels and touchpoints, but now what? You need to make sure your users are having a good experience no matter how they are interacting with your brand. Getting started may seem a little overwhelming, but the best way to start is to talk it out. Seriously. There’s no better way to understand if your users are having a good experience than by talking to them directly. Recruit real users to do interviews with you to better understand their experience. I recommend conducting at least 5 interviews to start, but the more you can conduct, the better. Make sure you get a range of users to accurately represent your user base as best as possible. Point of pre-purchase: What was the user’s need? What were they looking for? How did they hear about you? Point of purchase: How long did it take to make a decision? What was their deciding factor? Point of consumption: Was the product or service as described? Were they happy with their decision? Would they select you again next time? Point of conversation: What do they tell their friends about your product or service? Are they recommending you to others? Something to remember: These steps are not just limited to touchpoints with your brand. While these touchpoints are very important, you also want to understand the user’s experience even before the first touchpoint. This can be very valuable! Now that you have a better understanding of your users’ journeys, you can begin to map the common experiences. Create personas based on your users and map out their experiences so that you cover the range of what you heard in your interviews. You don’t need one map for every user you interviewed, but make sure every key experience is accurately represented. There are many ways to map a user’s experience, and they can be as complex or as simple as you need. No matter how you decide to do it, the goal is to visually show the highs and lows of your users’ experiences. By doing this, you can quickly find areas of opportunity to improve your brand’s omni-channel CX. Even with a simple template like the one above, you can quickly see where the high and low points of the users’ journeys are. You’ll likely start to see trends across the multiple experience maps you create, which can show where the experience is falling short for your users. Now it’s time to do something about it. Since every business is different, there’s no secret I can share that will magically improve your omni-channel CX. But I can give you one tip: Start by breaking down barriers in your organization. We often see that different departments within an organization (like sales and marketing) are siloed and don’t work together. Experience maps can be a great tool to bring multiple departments together to work toward one common goal: Giving your users the best experience, no matter the channel. Review the customer journey maps with all departments who are involved in the journey and brainstorm ideas of what you can do as a whole to improve the experience. After all, if we can give our users an exceptional experience across all channels and touchpoints, we all win. Luckily for you, you’ve already taken your first step in improving your omni-channel CX, understanding what the heck it is. With an understanding of the elements of omni-channel, as well as a basic framework for interviews and user experience maps, you can start improving your users’ overall experience with your brand. Yes, it can be a big undertaking and may take months (or even years) to be able to truly implement the necessary changes, but it can have big results. If your customers know they will have a positive experience with your brand no matter what, they will be more likely to select you over your competitors, time and time again. Isn’t that what we all want, anyway? Loyal customers who love our brand? Well giving your users a good omni-channel CX just may be the key.